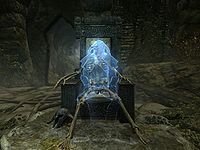 Valdar is an ancient Nord ghost inhabiting Valthume. He guards the tomb of Hevnoraak, but his strength is fading and he needs your help to stop Hevnoraak's return. He carries a leveled ancient Nord sword that can be up to a honed sword in quality, and wears a full set of matching armor. Upon entering Valthume, Valdar will immediately warn you: "Leave, stranger. Evil stirs in this place. I fear for the security of the very land if it should break free." If asked, he will tell you more about the evil: "We stand at the tomb of Hevnoraak, who has been dead for many generations. I fear, however, that his return may be at hand." Suggest that there must be a way to stop it, and he will reply, "I have been holding him here. While he regains strength, however, I am fading. By now I can barely contain his power, much less defeat him if he awakens. But with the help of a living champion I may be able to succeed." If you offer your aid, he will explain what must be done: "You would do this? Three vessels in the tomb below hold the power to vanquish Hevnoraak. Before anything else, we need those. Bring them to me - but be careful, mortal. They are guarded by Hevnoraak's minions. They will stop at nothing to see their master return." He will then sit on his throne. Before you are off to retrieve the items, you can ask for clarification, which he will give with optimism: "Find the three vessels within Valthume, then return to me. With these we can defeat him." 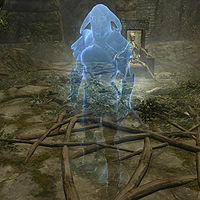 On why he is in Valthume, he will tell you, "Hevnoraak planned his resurrection obsessively before dying. My duty in life and in death is to make sure he stays in this tomb for eternity." If asked why he fears Hevnoraak, he will answer, "He had a way of enthralling people and built up a loyal army of followers. Good men fell under his spell and were forever twisted. Made... evil. After that, fear was enough to keep them in line. He could torture and humiliate them and they would not rebel. Even in death, they serve him still." When you return with the vessels, Valdar will ask, "Did you find all of the vessels?" when he notices you. Speak to him, and he will remark, "You've found the vessels. I worried that I had sent you to your death." Should you ask him, he will explain what to do with them: "In life, Hevnoraak drained his own blood from his body. His goal was to transfer his power back into himself after death, becoming a powerful lich. The vessels contain that very blood. Empty them and you remove any chance he has of regaining his former powers." If you comment that it seems dangerous, he will respond, "More dangerous than you know. Left alone, however, he will awaken when he has grown too powerful to be stopped. This is the only way to be sure." Tell him that you are ready, and he will say, "Very well. Empty the vessels into the sconce near the throne, then sit in the throne. When you have done so, I will unbind Hevnoraak. He will awaken in a weakened state, but the lich is still to be reckoned with. Be ready." If you attempt conversation, he will brush you off: "Do not interrupt the ritual. Go empty the vessels and sit on the throne." While you take a seat, Valdar will resurrect Hevnoraak, who will exclaim, "Fools! You will not hold me here any longer, Valdar!" while Valdar will tell you, "Kill him now, while we still can!" Once you dispose of the lich, Valdar may comment, "Hevnoraak is defeated." when you approach him. Bring him the good news, to which he'll say, "Thank you, hero. Now I may finally rest. Take Hevnoraak's iron mask. It may be of use to you, and serve as some reward for your feat here." He will then vanish. This page was last modified on 10 September 2014, at 19:32.